Yakov Kasman is a dedicated teacher with more than twenty years of pedagogical experience. Mr. Kasman is a graduate of world famous Moscow State Tchaikovsky Conservatory, a place with legendary teaching traditions. Kasman studied there with Mikhail Voskresensky, one the most sought-after Russian professors and pianists. Yakov Kasman served as a faculty member of College by Moscow State Tchaikovsky Conservatory in Moscow, Russia. Now he is a Professor of Piano/Artist-in-Residence at the University of Alabama at Birmingham. In addition, he provides private piano lessons to the students and teachers of Birmingham Area and nationally. Mr. Kasman has been a guest teacher at Conservatory of Puerto Rico, PianoTexas International Academy and Festival, Southeastern Piano Festival, International Summer Music Academy in Kiev, Ukraine, and more. He regularly gives master-classes around the world, including numerous master-classes at US colleges and universities, master-classes at Brevard and Sewanee Music Festivals, MTNA National Conference, Alabama Music Teachers Association and Oregon Music Teachers Association State Conferences, Tel'Aviv Music Academy and Jerusalem Conservatory in Israel, Moscow College by Moscow State Tchaikovsky Conservatory and Orel State Music College in Russia, Ecole Normale Alfred Cortot and Yamaha Centre in Paris, France, in Tokyo and Osaka, Japan. 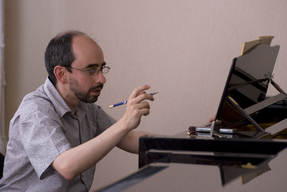 Yakov Kasman’s students successfully continue their music education in such prominent institutions as University of Alabama, University of Kansas, University of Michigan, Texas Christian University, New England Conservatory, Manhattan School of Music, Eastman School of Music, Cincinnati Conservatory, Moscow State Tchaikovsky Conservatory and others. at the Alys Stephens Center, Reynolds-Kirschbaum Recital Hall. Polyphonic music festival "Bach and Friends".